Spring is here....calving season has begun. With the arrival of calves comes a little stress. The sight above often drives me crazy, I mean how do people get in and out of the doorðŸ˜‰, however at this time of year its a regular occurrence and necessity as he does barn checks at different hours of the day or night. Steve loves spring! He loves all that it has to offer. New growth, new arrivals, fresh starts. Heâ€™s very passionate about his herd, and gets a little anxious when calving season comes along each year. We have 50+ cows that are expected to calve within a 6-8 week time frame. The first couple of calves to join us in 2019 did so completely effortlessly, they are healthy & happy and running around, cute as can be! 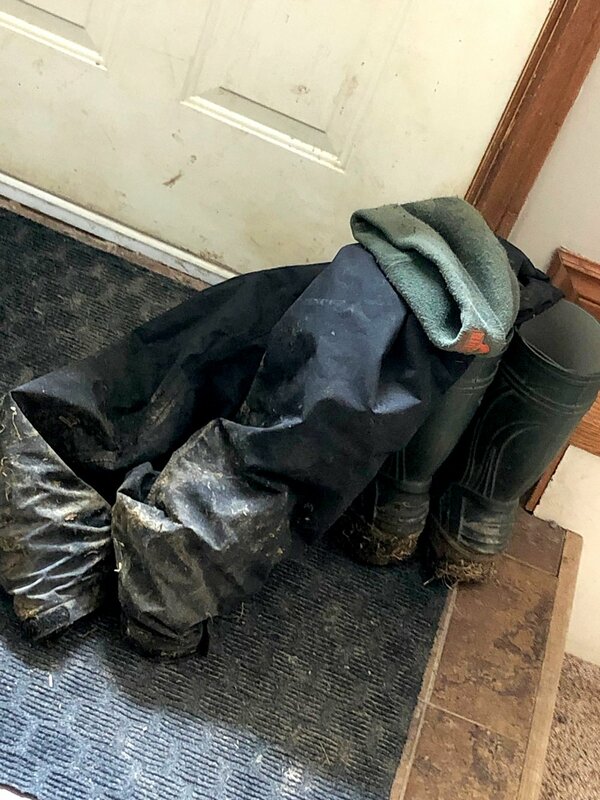 Often in calving season there are so many things that can and do go right, but on the flip side there are so many things that can and sometimes do go wrong, unfortunately. On Sunday Steve went out to check the cows first thing in the morning. 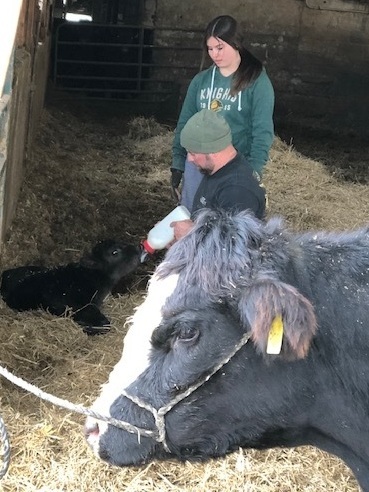 As Iâ€™ve mentioned before, in our home Sunday is a â€œday of rest.â€� As Iâ€™ve also previously mentioned the animals still need to eat, so Steve headed out to do a few chores, the calf check and then the plan was to head to church for the 10:30am service as usual. As I was getting ready, and helping the boys to do the same, my cell phone rang. It was Steve in a bit of a winded panic. He was asking for help in the barn, as a cow had gone into labor with what appeared to be a set of twins. The first twin was out, born backwards. He was attempting to give it mouth to mouth to kick start itâ€™s life, however struggling with mama who was in â€œprotective mama bearâ€� mode and not very happy with Steve. He was able to feel a heartbeat for about 15 minutes, but his efforts were unsuccessful. The second twin was also coming backwards, which is not something you want to see. Steve was able to help and pull it out so it didnâ€™t ingest anything in the birth canal, and it was a successful delivery! Because stuff like this never happens when you are hanging around the farm with nothing to do, we went off to church without him once he gave the okay. He continued his rounds and came upon a calf that had literally just been born as well. He noticed it wasnâ€™t getting up to get that first crucial drink from mom. He attempted to hold it up, however itâ€™s front legs were crossed and didnâ€™t want to uncross when left to try to stand on itâ€™s own. Steve gave enough time for the calf to attempt things on its own, and then he had to intervene. So he grabbed a bottle, and milked the cow to give it that first important drink of colostrum. The baby was hungry and a willing participant which is sometimes half the battle. It becomes a wait and see game with these little gaffers. Much like the human versions, they often just need a little time. In the mean time, Steve does everything he can to give it a fighting chance. As much as this is a â€œbusinessâ€�, it is still a lifestyle, way of life, where there is a lot of compassion and empathy. Steve now watches the calf (which he named LucyðŸ˜‰) around the clock, milks mama, and bottle feeds her every couple of hours. He provides her with every opportunity to succeed, its up to Lucy to want to fight! Just yesterday (Wednesday), Lucy made her first attempt to get up and stand....a big success. Steve was there to see it, and likely has a video to prove it...haha. Steve is good to his animals, and some of the cows have been with him for 12+ years. Each year they give him a healthy calf, and they wander the pasture fields content and happy! He knows each mama personally, takes notes on each of their births, how they handled it, any assistance they needed. He watches them, jumps in and helps them whenever required. He never gets bored of checking for new calves, monitoring their progress, and finding out the gender. As Iâ€™ve said before he loves his farm, and he loves his cattle. He goes to great lengths to ensure they are healthy and happy always. Yes they serve a purpose, but while they are here with us they live their very best life that we can possibly offer them!